Cultural Care staff member Carly DeCoste recently embarked on an incredible service trip to Port-au-Prince, Haiti through the United States Foundation for the Children of Haiti (USFCH); it was there, with a special grant from Kids First, that she helped bring some much-needed hope and aid to the people living in one of the most impoverished countries in the world. Carly was inspired to travel to Haiti after seeing the impact that USFCH had on her boyfriend and his family through their service trips over the years. After hearing stories and seeing pictures, Carly knew she had to see the country firsthand – and help the children of Haiti in any way she could. So she reached out to another organization that she knew had the best interest of children in need around the world at heart: Kids First. Kids First was thrilled to partner with an active volunteer and member of the Cultural Care community, and to help make her trip to Port-au-Prince more meaningful. It was soon decided that the Suitcase of Supplies grant – a grant provided by Kids First to provide an organization with supplies that will directly benefit children living in poverty – would best align with Carly’s trip. Carly used the funds to purchase supplies for the school at the Children’s Village in Port-au-Prince as well as for the baggage fee to fly the suitcase to Haiti. She brought with her a variety of books, folders, pens/pencils, highlighters, crayons and more to present to the school during her visit. These supplies will make a big difference for the children and teachers this coming school year, as their community has so few educational and economic resources. In fact, Haiti has long struggled with extreme poverty after two major, catastrophic environmental events in the 21st century – an earthquake in 2010 and a hurricane in 2016. These riots represent only a small fraction of the polarized political climate and extreme danger that the people of Haiti experience on a daily basis. That’s why it’s so important for people like Carly – together with Kids First and non-profits like USFCH – to do whatever they can to improve the lives of children and families impacted by these turbulent times. 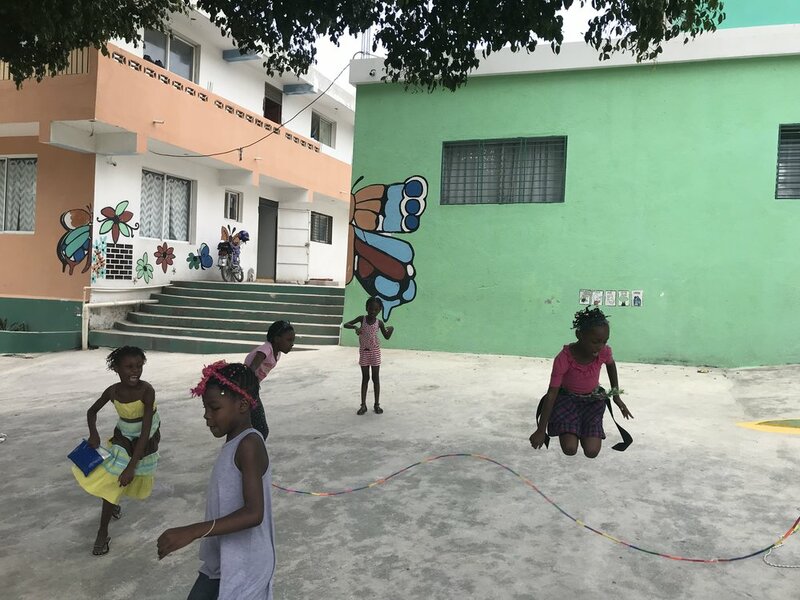 While in Haiti, Carly’s group worked with the Fondation Pour Les Enfants d’Haiti (FEH) – the organization that runs an orphanage, nursery and school for children in Port-au-Prince. Each morning, Carly and her fellow volunteers (13 people total) drove to the Children’s Village to spend their days leading a summer camp for children consisting of games, activities and meals. After working there for a few days, Carly and her group decided to plan a special excursion to a local beach – specifically as a way to give the disabled children at the orphanage a chance to get out and do something unique. Kids First is deeply grateful to Carly and the entire volunteer group for helping change the lives of children in Port-au-Prince through the Suitcase of Supplies grant – and is already looking ahead to its next project to help kids around the world.